A recent report of Pakistan Council for Research in Water Resources (PCRWR) has shown that 84 percent water samples collected from district Gujrat are unsafe as per PSQCA Standards and can cause hazards to the health of human being. This survey was done by Pakistan Council for Research in Water Resources (PCRWR) carried out the survey under National Water Quality Monitoring Program (NWQMP). 14,000 drinking water samples from 2807 villages of 80 tehsils of 24 districts of Pakistan were analyzed. 82 percent of these samples were unsafe as per standards of Pakistan Standards Quality Control Authority (PSQCA). You are requested to evaluate your drinking water from a laboratory and take necessary actions as suggested by an expert / Doctor to prevent yourself and your family from diseases. Always drink boiled water. 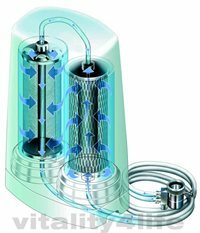 If the water is polluted, you should install a Water Filter at your home, office, factories or work place. Various types of water filters are available in markets at very affordable price. Always Drink Clean Water and Eat Healthy Food. Came over to leave a comment as promised. Looks as though you are doing a great job of informing people of the problems in Gujrat. Good to see someone providing a public service - keep up the good work and many thanks for your comments over on easyP. 84 % of the water is unsafe? Do the people who are drinking that water know?